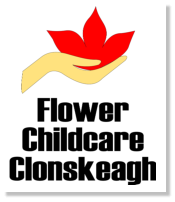 Flower Early Learning Centre serving children ages 24 months through three years. We have a broad curriculum implemented in an environment that promotes social and emotional growth, skills of independence, cultural diversity, problem solving, and most importantly, a love of learning that are supported by The Early Childhood Curriculum Framework - Aistear and Siolta. Within a safe and loving atmosphere, our materials and curriculum are based on developmentally appropriate needs of the children in our centre. Cultural diversity is present though books, puzzles, dolls, diversity among the children and diversity among the staff. Below is an outline of our daily routine. Please note that between 8:15 and 10:00 we do a great deal of reading and often offer table activities such as puzzles, drawing or playdough. Within this schedule the children are offered a great variety of learning opportunities. 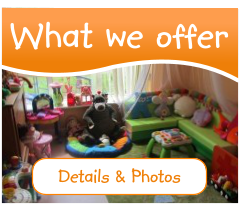 The toys and materials offered vary from day to day and throughout each day. The children learn how to follow a routine and to act as responsible and caring members of a community (e.g. the children participate in clean-up time once or twice daily). As the children grow and develop we encourage the development of their skills of independence. For infants, this means learning to fall asleep independently, self feeding, and, when old enough, being able to sit and play with toys for a few moments. Older toddlers learn to put on and take off shoes and outerwear, use the potty, get in and out of chairs and other furniture, etc. Problem solving skills are developed at every turn. In our playground this ranges from motor planning to cooperative play. Young toddlers learn how to climb, get in and out of toy cars, the sandbox and an assortment of riding vehicles. In groups, the children are supported in using their emerging language skills to negotiate turn-taking, take roles in imaginary play and in creating rules of made-up games. Indoors, the toys available to the children consistently present problem solving opportunities. These include but are not limited to bristle blocks, stacking pegboards, magnet blocks, Duplo blocks, shape sorters, stacking toys, puzzles of increasing levels of difficulty, ball mazes and bead mazes. Our philosophy is that children at this particular age learn best through play and interest, we let children to choose their own subject such as the ocean or transport and then the teachers develop the topics to a wider activities such as arts, getting the right books and materials that’s relate to the child preferred subject. We use books and other materials to teach colours, shapes, counting, sorting and letter and number recognition. We also cover these curriculum areas through circle time and song activities. We continually discuss colour, form and texture through our art activities, as well as at mealtime. Activities that present opportunities to teach science and knowledge include cooking, playdough, sand and water play, ball mazes, and blocks. Of course, many of the books in our library present opportunities for teaching science. Examples are Planting a Rainbow, by Lois Elhert, The Very Hungry Caterpillar by Eric Carle, Dinosaur, Dinosaur and Bones, Bones, Bones by Byron Barton, Little Blue and Little Yellow by Leo Leonni. These books are sometimes paired with other activities such as planting seeds and following their growth, playing with toy dinosaurs, or exploring colour with paint or food colouring. Books are used to support many of our curriculum goals. They present not only science, but examples of and opportunities for problem solving, exposure to other cultures, emerging math and literacy skills, and perhaps most important of all ‚ a love of books. Curriculum Flower Early Learning Centre serving children ages 24 months through three years. We have a broad curriculum implemented in an environment that promotes social and emotional growth, skills of independence, cultural diversity, problem solving, and most importantly, a love of learning that are supported by The Early Childhood Curriculum Framework - Aistear and Siolta. 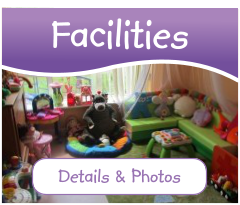 Within a safe and loving atmosphere, our materials and curriculum are based on developmentally appropriate needs of the children in our centre. Cultural diversity is present though books, puzzles, dolls, diversity among the children and diversity among the staff. Below is an outline of our daily routine. Please note that between 8:15 and 10:00 we do a great deal of reading and often offer table activities such as puzzles, drawing or playdough. Within this schedule the children are offered a great variety of learning opportunities. The toys and materials offered vary from day to day and throughout each day. The children learn how to follow a routine and to act as responsible and caring members of a community (e.g. the children participate in clean-up time once or twice daily). As the children grow and develop we encourage the development of their skills of independence. For infants, this means learning to fall asleep independently, self feeding, and, when old enough, being able to sit and play with toys for a few moments. Older toddlers learn to put on and take off shoes and outerwear, use the potty, get in and out of chairs and other furniture, etc. Problem solving skills are developed at every turn. In our playground this ranges from motor planning to cooperative play. Young toddlers learn how to climb, get in and out of toy cars, the sandbox and an assortment of riding vehicles. In groups, the children are supported in using their emerging language skills to negotiate turn-taking, take roles in imaginary play and in creating rules of made-up games. Indoors, the toys available to the children consistently present problem solving opportunities. These include but are not limited to bristle blocks, stacking pegboards, magnet blocks, Duplo blocks, shape sorters, stacking toys, puzzles of increasing levels of difficulty, ball mazes and bead mazes. Our philosophy is that children at this particular age learn best through play and interest, we let children to choose their own subject such as the ocean or transport and then the teachers develop the topics to a wider activities such as arts, getting the right books and materials that’s relate to the child preferred subject. We use books and other materials to teach colours, shapes, counting, sorting and letter and number recognition. We also cover these curriculum areas through circle time and song activities. We continually discuss colour, form and texture through our art activities, as well as at mealtime. Activities that present opportunities to teach science and knowledge include cooking, playdough, sand and water play, ball mazes, and blocks. Of course, many of the books in our library present opportunities for teaching science. Examples are Planting a Rainbow, by Lois Elhert, The Very Hungry Caterpillar by Eric Carle, Dinosaur, Dinosaur and Bones, Bones, Bones by Byron Barton, Little Blue and Little Yellow by Leo Leonni. These books are sometimes paired with other activities such as planting seeds and following their growth, playing with toy dinosaurs, or exploring colour with paint or food colouring. Books are used to support many of our curriculum goals. They present not only science, but examples of and opportunities for problem solving, exposure to other cultures, emerging math and literacy skills, and perhaps most important of all ‚ a love of books.